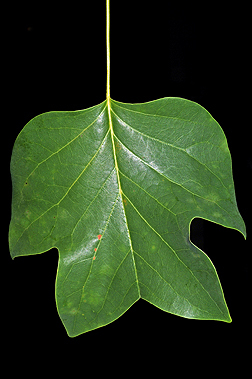 Leaf:Alternate, simple, palmately veined, orbicular, 4-lobed with an entire margin, 4 to 8 inches long, notched to flat top. 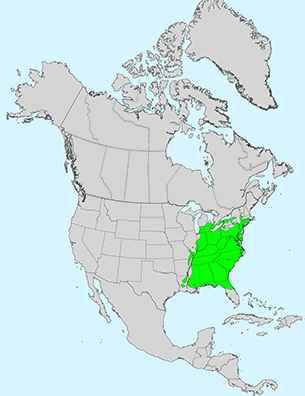 Somewhat shaped like a tulip, light green to green. 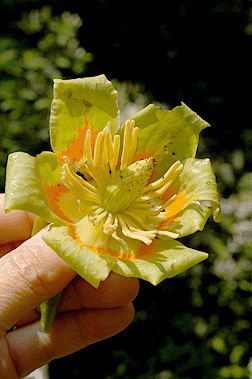 Flower:Perfect, showy, resembling a large tulip, but high in the tree, 2 1/2 inches long, with yellow-green petals and an orange corolla, appearing in late spring to early summer. 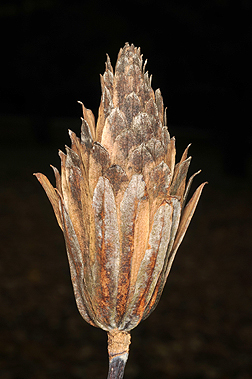 Fruit:An oblong (cone-like) aggregate of samaras (2 inches long), deciduous at maturity; each samara is 1-winged, 1 1/2 inches long, and curved upwards at seed cavity (resembling the front keel of a boat); maturing August to October and disseminating through late fall and winter; base whorls of samaras persist on fruit into following spring and resemble wooden flowers high in the tree. Twig:Red-brown in color, often with a shiny appearance or a waxy bloom. Stipules are large and encircle the twig; buds are elongated and valvate, resembling a "duck bill". Twigs have a sweet, spicy odor when broken. 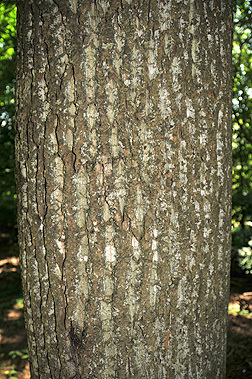 Bark:Light gray-green and smooth when young, later developing flat-topped ridges and conspicuous white colored furrows in diamond shaped patterns. On older trees sapsucker holes are common. 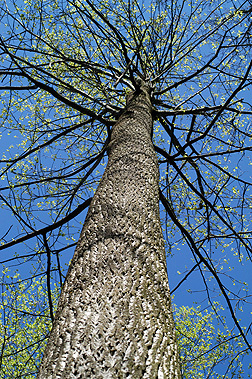 Form:In a forest, a large tree with a long, straight limb-free bole very often reaching over 100 feet tall. Open-grown trees have a pyramidal crown when young, becoming oval in shape with time.